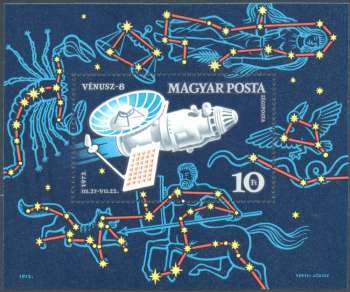 VÉNUSZ-8 MAGYAR POSTA LÉGIPOSTA 1972 III.27-VII.22 10 Ft 1973. Upon Venus arrival Venera 8 used aerobraking to decelerate, and then deployed a parachute. A refrigeration unit cooled the spacecraft's components, protecting them from the intense heat as the lander descended to the surface. Once on the ground, the spacecraft transmitted data for 50 minutes, confirming a very high surface temperature and crushing atmospheric pressure. It also measured the light level on Venus’ surface and found it suitable for surface photography, setting the stage for the images to be returned by Venera 9, 10, 13, and 14.